Addons Catalog: list of addons included with Blender and external. Addons Process: how to get your addon included and maintain it. Submit Addon: submit an addon that you want included with Blender. Francesco Sorrentino (zeirus) added a comment to T63692: Collada: Lost all instances of collections when exporting from .blend to .dae. @Francesco Sorrentino (zeirus) : Can you provide a demo blend file so that i can be sure i am inspecting what you actually mean and not what i think that you mean ? Thanks! Gaia Clary (gaiaclary) added a comment to T63692: Collada: Lost all instances of collections when exporting from .blend to .dae. Sebastian Parborg (zeddb) updated subscribers of T63588: Cycles does need recalculate MIP after modifying a material. I can't render with a GPU so I can't reproduce this. @Brecht Van Lommel (brecht), @Jeroen Bakker (jbakker) are you able to reproduce? Jacques Lucke (JacquesLucke) added a comment to T63856: export to after effects. Hi, thanks for updating the addon. ADI SAMSONOFF (adi.samsonoff) updated the task description for T63856: export to after effects. ADI SAMSONOFF (adi.samsonoff) created T63856: export to after effects. Philipp Oeser (lichtwerk) added a comment to T63849: How can I commit fixed for compatibility with 2.80 contrib addon authorship of another user. RUben (KUbo_0) added a comment to T63849: How can I commit fixed for compatibility with 2.80 contrib addon authorship of another user. RUben (KUbo_0) created D4729: curve_tools 2 compatible 2.80. Philipp Oeser (lichtwerk) assigned T63843: 2.8 .blend incompatible with Unity to Bastien Montagne (mont29). thx again for getting back. RUben (KUbo_0) added a watcher for Addons: RUben (KUbo_0). Rogério Dec (rogeriodec) added a comment to T63843: 2.8 .blend incompatible with Unity. Philipp Oeser (lichtwerk) added a comment to T63843: 2.8 .blend incompatible with Unity. 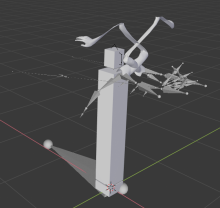 what I meant was: if you import this FBX back into blender, do you face the same issues? Philipp Oeser (lichtwerk) closed T63849: How can I commit fixed for compatibility with 2.80 contrib addon authorship of another user as Archived. Thx for looking into providing addon fixes, very welcome! Philipp Oeser (lichtwerk) raised the priority of T63588: Cycles does need recalculate MIP after modifying a material from Needs Information from User to Needs Triage by Developer. RUben (KUbo_0) updated the task description for T63849: How can I commit fixed for compatibility with 2.80 contrib addon authorship of another user. RUben (KUbo_0) triaged T63849: How can I commit fixed for compatibility with 2.80 contrib addon authorship of another user as Confirmed, Low priority. have you tried different settings of the exporter? Philipp Oeser (lichtwerk) updated the task description for T63843: 2.8 .blend incompatible with Unity. Ok, if you have access to DiscordApp you can see the thread here. Philipp Oeser (lichtwerk) triaged T63843: 2.8 .blend incompatible with Unity as Needs Information from User priority. Afaik, Unity will convert to fbx [with blenders fbx exporter] when trying to import .blends. So this is an FBX issue. Philipp Oeser (lichtwerk) edited projects for T63843: 2.8 .blend incompatible with Unity, added: Addons; removed BF Blender. Brendon Murphy (meta-androcto) added a comment to T63750: Remove Broken Addons from Release and Contrib. Luciano Muñoz Sessarego (looch) updated the task description for T63485: Rigify 2.8 - general improvements..
Brendon Murphy (meta-androcto) added a comment to T63682: looptools gstretch/gpencil bug. ma kadir (mak485) added a comment to T63682: looptools gstretch/gpencil bug. in general, it was working with 2.80.54 (abt 6th april build), some thing changed by this time. Philipp Oeser (lichtwerk) added a comment to T58701: Node Wrangler add-on: viewer node bug. Brecht Van Lommel (brecht) closed T63778: emissive ignored when importing .obj as Archived. We'll add an emission socket to the principled BSDF later, for now this is not considered a bug but a known limitation. Philipp Oeser (lichtwerk) triaged T63778: emissive ignored when importing .obj as Confirmed, Medium priority. Will confirm for now [because atm. it is indeed ignored]. There was rBA94c9c4ee3370, but since the move to Principled BSDF it is ignored and this seems to be a known issue. WARNING, emit value unsupported by Principled BSDF shader, skipped. It is a bit unclear how to handle this properly. Philipp Oeser (lichtwerk) edited projects for T63778: emissive ignored when importing .obj, added: Addons; removed BF Blender. Philipp Oeser (lichtwerk) renamed T63682: looptools gstretch/gpencil bug from looptools gstretch bug to looptools gstretch/gpencil bug. Philipp Oeser (lichtwerk) triaged T63682: looptools gstretch/gpencil bug as Confirmed, Medium priority. Philipp Oeser (lichtwerk) renamed T63682: looptools gstretch/gpencil bug from looptools BUG! to looptools gstretch bug. Philipp Oeser (lichtwerk) merged T63811: Looptool Gstretch not working into T63682: looptools gstretch/gpencil bug. Philipp Oeser (lichtwerk) merged task T63811: Looptool Gstretch not working into T63682: looptools gstretch/gpencil bug. Philipp Oeser (lichtwerk) added a comment to T63811: Looptool Gstretch not working. Philipp Oeser (lichtwerk) edited projects for T63811: Looptool Gstretch not working, added: Addons; removed BF Blender. Brecht Van Lommel (brecht) closed T63780: HardOps Problem with Sharpens as Archived. The Hard Ops add-on is not maintained by the Blender project, you should report errors to the Hard Ops authors instead. Volodymyr (Chomusuke8691) created T63780: HardOps Problem with Sharpens. Joel Araújo (Joelino) added a comment to T63083: Burned Out Screen Space Reflections in Eevee Viewport. I have exactly the same problem. When I activate SSR, all reflections from reflections objects get all of control. Makes the exact same thing in the image you posted and usualy the "burned" effect is black. Brecht Van Lommel (brecht) added projects to T63733: Python & Add-ons Module: Python, Addons. hi, work will begin on this soon. "In general prefer if we stop being central repo for too many addons though" and that "Would prefer external repo model"
There's no issue from me here. Brecht Van Lommel (brecht) edited projects for T63670: FBX from Maya imports with incorrect UVs in 2nd channel, added: Addons; removed BF Blender. Ariel Gimenez (Kone9) added a comment to T63682: looptools gstretch/gpencil bug. George Vogiatzis (Gvgeo) raised the priority of T63682: looptools gstretch/gpencil bug from Needs Information from User to Needs Triage by Developer. From what I can tell, grease_pencil was in object or scene in 2.79. The addon used the objects grease_pencil to stretch the vertices. Now grease_pencil is a separate object. The error is exactly that, object has no grease_pencil anymore. Not sure how the annotation work. Must be in scene? George Vogiatzis (Gvgeo) closed T63754: NLA Additive Animation Layers as Invalid. This bug has no description of the problem. But more importantly I don't believe this add-on comes with blender. Should ask the creator of the add-on for more info. Yianni Papazis (YianniP) created T63754: NLA Additive Animation Layers.